Manufacturer of a wide range of products which include food metal detector and stone metal detector. A little piece of metal in a food product can not only affect the health of a person but can also ruin the reputation of your company among your customers. Understanding the importance of Metal Detectors in this competitive industry, Das Electronics brings forth the best range of Food Metal Detectors for the clients worldwide. 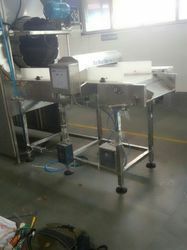 We are known as one of the chief Metal Detector For Food Suppliers in India. Our Food Metal Detectors are designed to detect even the smallest of the metal object to ensure 100% purity of a food product. These metal detectors are majorly used in companies dealing in dairy products, sea food, spices, dry fruits, meat processing, grains, confectionary items, etc. Customised (Tailor made) aperture sizes are available. According to HACCP, GMP and FDA standard. Audio and visual indication on metal detection. Different models are available according to application. Model-FMD (Ferrous Metal Detection)-Detects Ferrous metal in metallised (aluminium) film packaging. Model-FAMD-combination of above two (AMD+FMD) models. Pneumatic flap, Air jet, diverter arm, belt retracting, belt stop types of reject mechanism as per applications. MOC- SS and MS available. Ip65 control panels are available. Comprehensive manual with validated test calibration kits with certificates for validation test. Applications : Ideal for Food processing, Dairy, Packaging industries, Sea food, Spices, Dry- fruits, Meat processing, Grain, Confectionary etc. High quality component support provides our Metal detector strength to work under high pressure conditions. 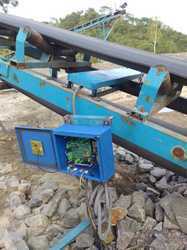 Looking for Industrial Metal Detector Belt Conveyor ?